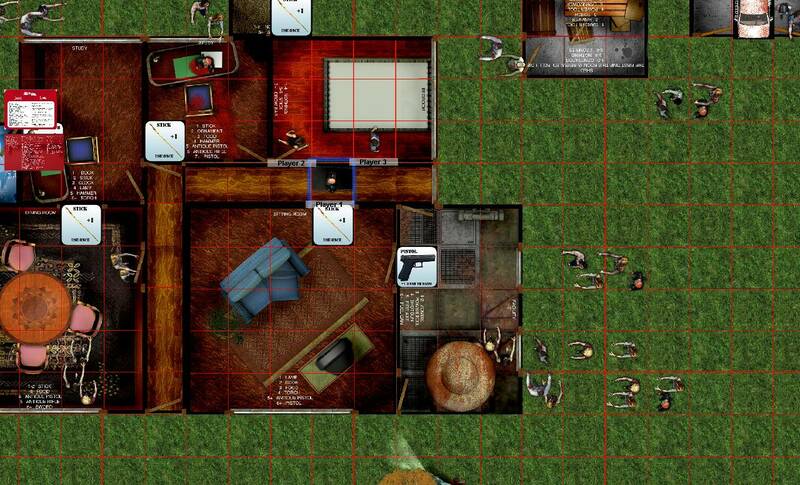 Two to six players must survive a zombie onslaught until dawn. The game can be played cooperatively or competitively. 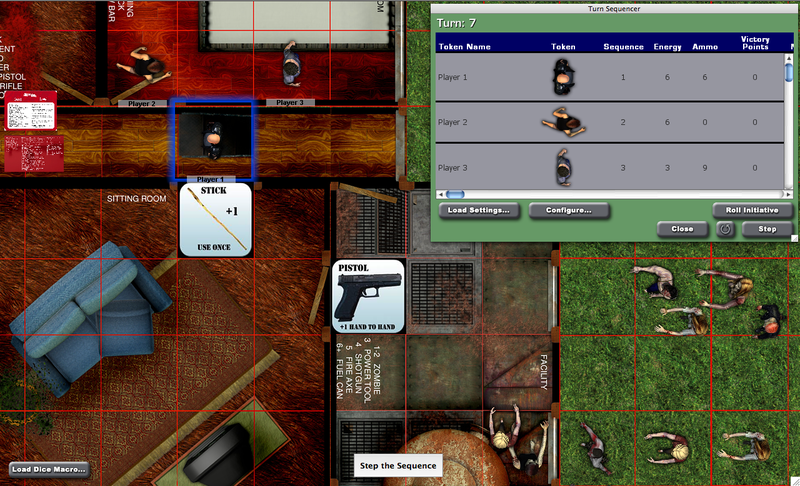 It can also be played solo, using automatic zombie movement rules. “Dead of Night” is a free Print-and-Play boardgame by Simon Spearing. It was originally released in 2007. For more information on the original game, click here. Like Zombie Plague, Dead of Night is very reminiscent of the classic George Romero zombie movie, “Night of the Living Dead”. Here are some screenshots of what the game looks like (the pics were actually taken in BRPG, but the game looks the same in BGE). Click on the images to view them at full size. If the scale of the figures looks a little “off” in the above pictures, it’s because the game allows up to four zombies to occupy a single square, so I had to shrink all the figures uniformly to keep it from looking like the zombies were midgets compared to the humans. Tokens on character cards are how players keep track of their inventories. The above download contains everything needed to play the game (including Scenario 1) if you already have at least one Gamer Client license (BGE v1.5 or higher). For multiplayer games, the extra players will need a Gamer Client of their own, or they can use the free BGE Demo if the person hosting the game has enough free Player Slots available for them to use.